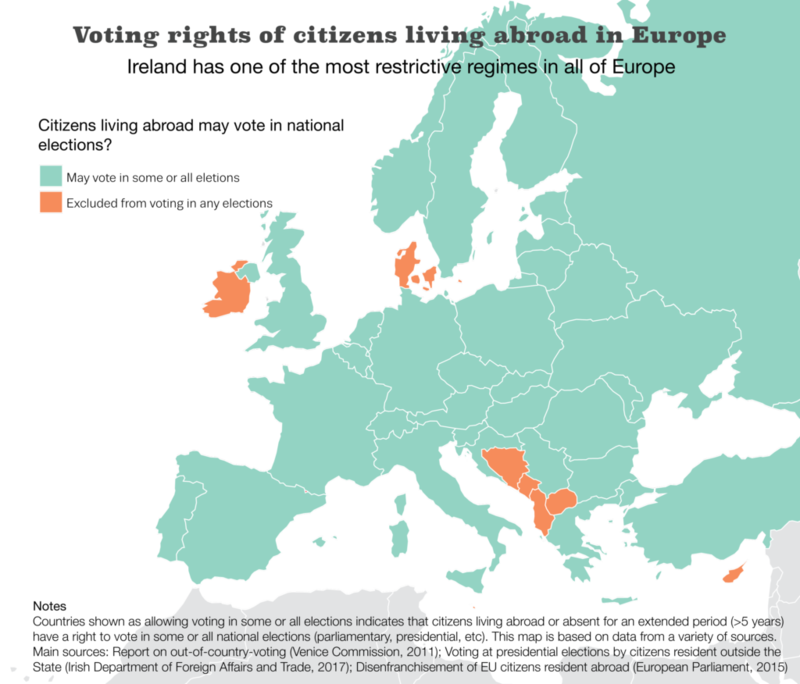 Question: How does Ireland compare to other countries in terms of allowing citizens living abroad to vote? In autumn 2019, Ireland is planning to hold a referendum which, if passed, will allow citizens abroad to vote in presidential elections. But how common is this in other countries? 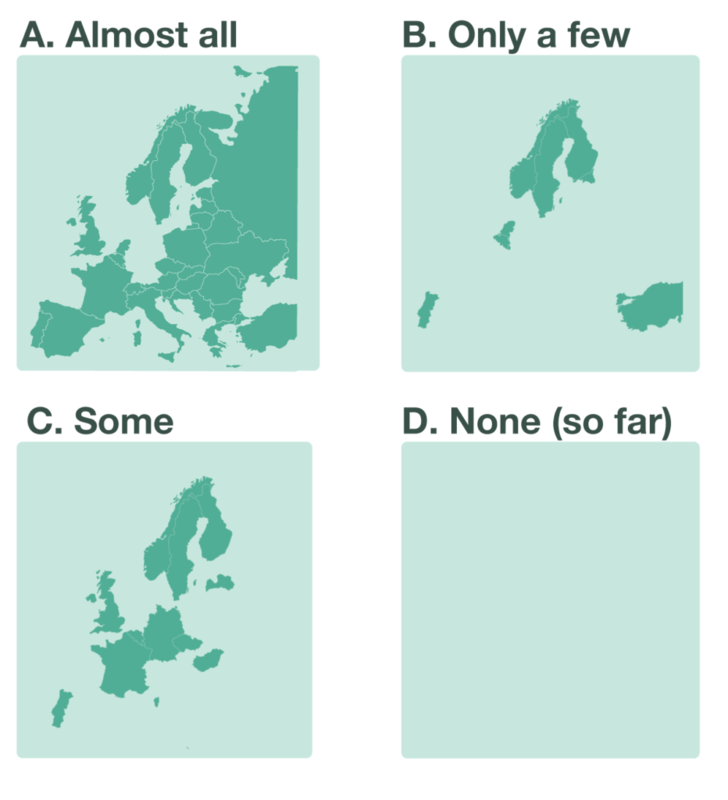 Which of the four maps below show the European countries that allow their overseas citizens to vote in national elections? Spoiler alert: The correct answer is a little further down this page but if you don’t know the answer, have a think and see if you can guess correctly. The result might just surprise you. The right answer is actually A: almost every one of our European neighbours allows their citizens resident abroad to vote in national elections. In fact, far from being a novel idea, the enfranchisement of citizens abroad is the norm in most modern European democracies. The overwhelming majority of European countries make provisions for emigrant voting. In over 30 European states, this right is recognised without any restrictions concerning the period of absence or even the obligation to have resided in the country. Two further countries, Germany and the United Kingdom, restrict voting but to a lengthy time period of 25 and 15 years and respectively. Among EU states, Ireland is alone with Cyprus, Denmark and Malta in not enfranchising its citizens abroad. It seems clear that Ireland is now out of step with most of its European neighbours. Throughout the world, 102 countries out of a total of 195 allow their citizens living abroad to vote in some or all national elections. However, the vast majority of Western countries do make provisions for emigrant voting. Ireland is one of the only countries in the Western world not to enfranchise its citizens abroad. But this year we have a chance to change that. 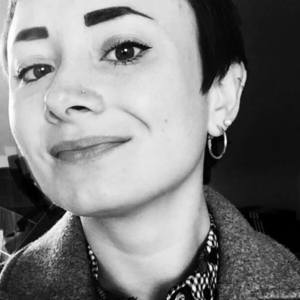 In October 2019 Ireland will be asked to vote in a referendum on granting Presidential voting rights to non-resident citizens, beginning to put us in line with the countries above, and helping to affirm the connections between Irish citizens living in the Republic and those living in Northern Ireland, the rest of Europe, and the rest of the world.